At Artsmart in London, Shedman was interested to see Etsy promoting their online community of makers and sellers. 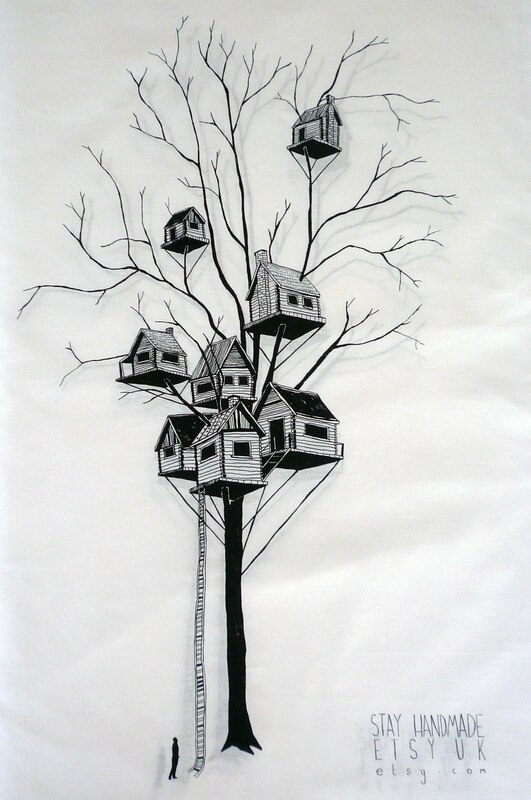 One of their giveaways was the tea towel pictured above featuring a tree of sheds - an interesting image, suggesting growth, networking and the unique role of the shed for artists and craftspeople. At the bottom, the strapline: 'Stay handmade'. Their approach seems to be paying off. In May 2011, Etsy sold 2,006,810 items worth $40.0 million - a 75% increase on May 2010. Shedman can't remember who said something like 'All a business needs is to make it and sell it', or that many successful businesses started off as a partnership between someone who could make the product and someone who could sell it. Etsy - and other sites like it - offer a way for makers to access their market globally through the partnership of an online salesperson. There's the thorny issue of quality here. One person's crafted birdhouse is another's lump of shed junk. But there's a democracy of demand here, and a refreshing lack of elitism. Many makers may have honed their talents and skills in the academy but the academy remains the training ground not the arbiter. The number of Etsies who work in a shed must run into thousands, so in their honour Shedman has added an Etsy shed search to the sidebar.